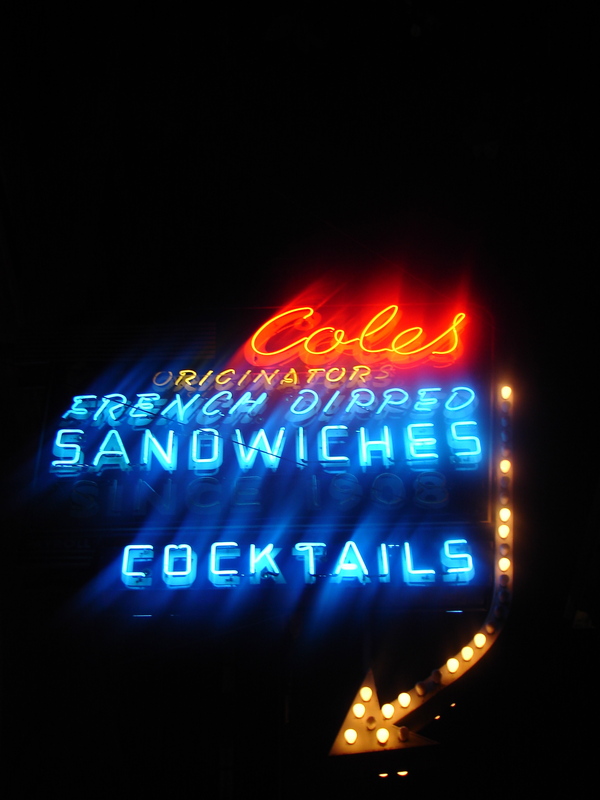 Forget about Ali/Frazier, the biggest fight in Los Angeles happened a week after we visited Philippe’s, when Dan and I visited the Los Angeles “French Dip-inventing” contender, Cole’s. If you remember, the previous Friday we had eaten at Phillipe The Original, an establishment that purports to have been the place where the French Dip Sandwich was invented. Now, with apologies to Paul Harvey (wait a minute, no apology necessary; he’s dead), here’s the rest of the story. 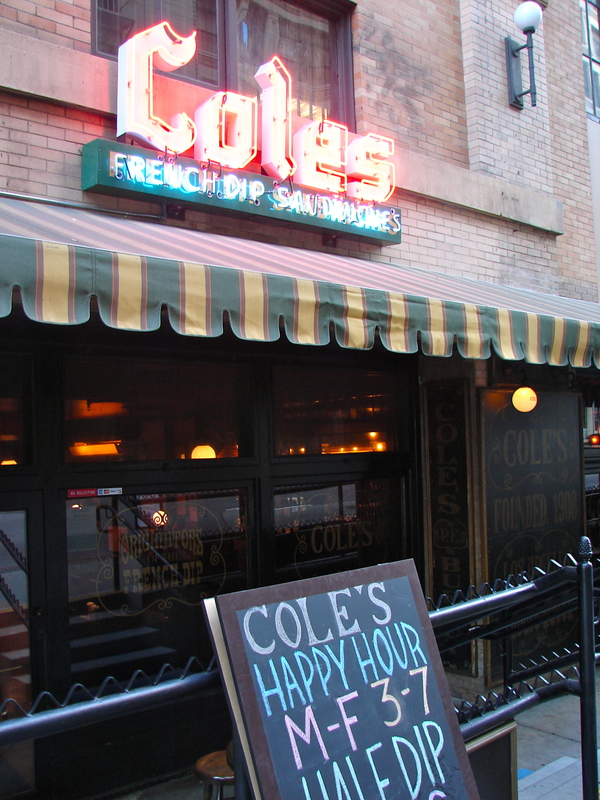 Just like Philippe’s, Cole’s opened for business in 1908. At the corner of Sixth and Main, Cole’s resides in the “hollows” of the ten story Pacific Electric Building (the tallest “skyscraper” in L.A. in the early part of the 20th century). It was owned by Henry Cole, who also operated the first check cashing service in Los Angeles from his restaurant. 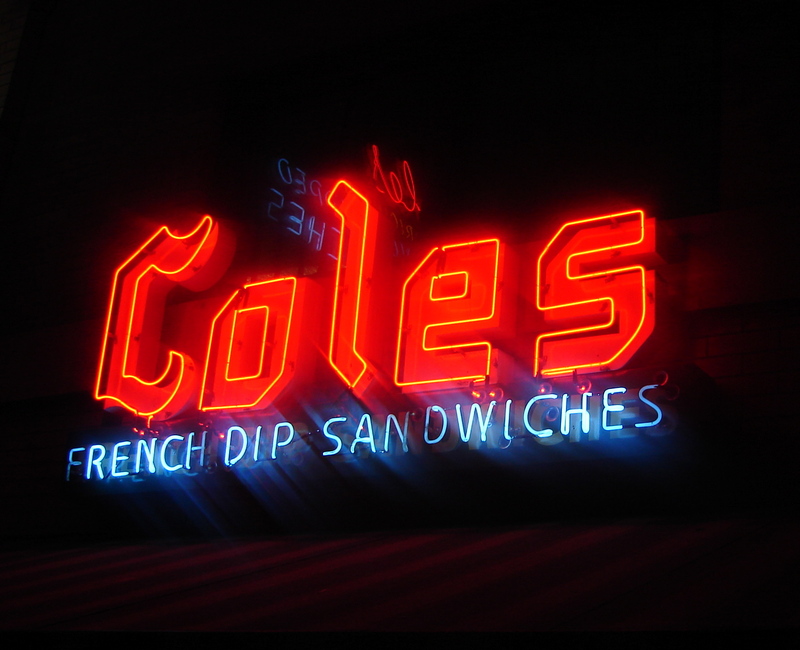 Here is Cole’s version of how the French Dip Sandwich was introduced to America. 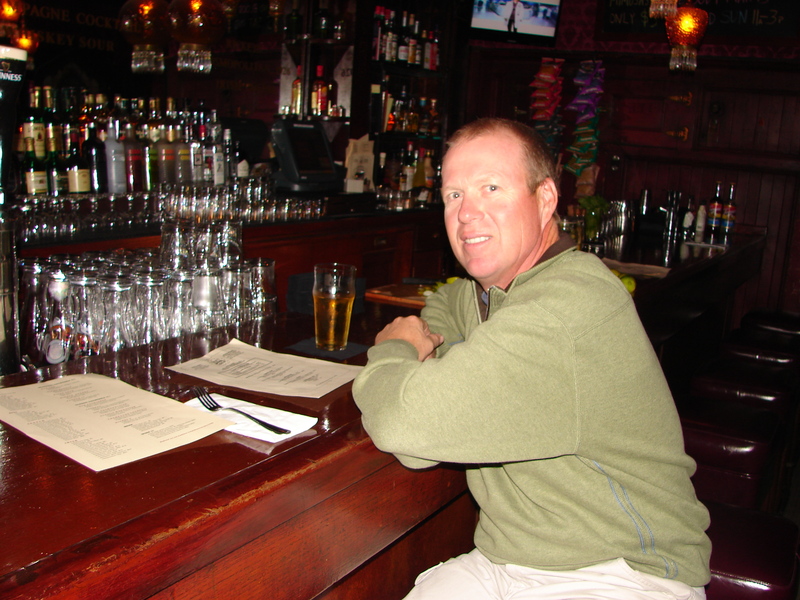 In the early part of the 20th century, thousands of people would pass near Cole’s because the Pacific Electric Building was the terminus for the Red Car Trolley Line, making a convenient customer base for the restaurant. Legend has it that one of Cole’s customers came in one day and complained of sore gums. He asked the chef to dip the beef sandwich into the juices to soften the roll and make it easier to eat. It was such a hit (the French Dip, not the sore gums) that people started flocking to Cole’s to enjoy these soggy delights. 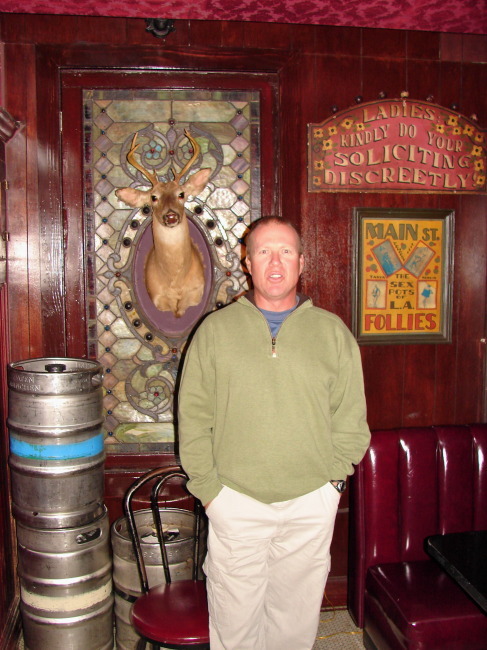 When I worked in downtown Los Angeles for about five years in the early 1980s, I probably had lunch at Cole’s once or twice a week. In those days, you would get your food cafeteria-style and then find a place to sit. But enough about history. Let’s fast forward to the present. I had not stepped inside Coles since 1984. Since then, the restaurant has undergone a 1.5 million dollar facelift. Walking in from under street level you come face to face with a beautiful bar that Dan said reminded him of a “bar that you would expect to find in New York City, “ and that’s where we sat to enjoy a libation and a sandwich (if bar dining is not your idea of comfort, Cole’s offers red leather booths that I believe will suit your needs…see the photo I took above). If you order a Manhattan, “one” is the key word. Do not operate heavy machinery within an hour of drinking this potent potable (thank you Jeopardy). 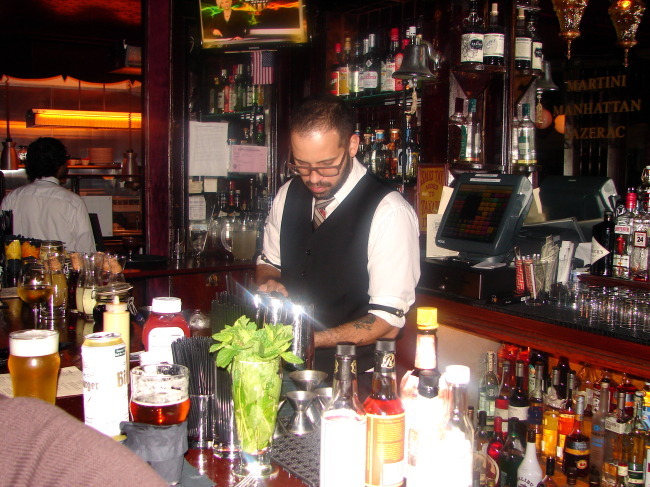 Cole’s prides itself on employing “real” bartenders, not ones that are looking for a job in the movies. 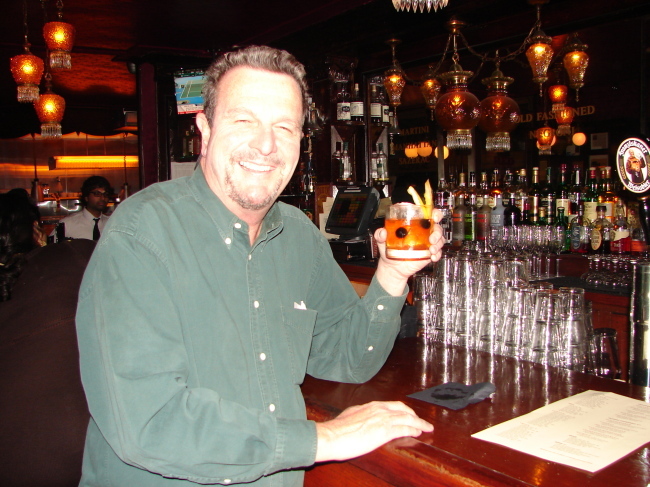 The Cole’s Manhattan consists of Buffalo Trace Bourbon with a Bitters and Sugar-Soaked Ice Cube large enough to sink the Titanic. 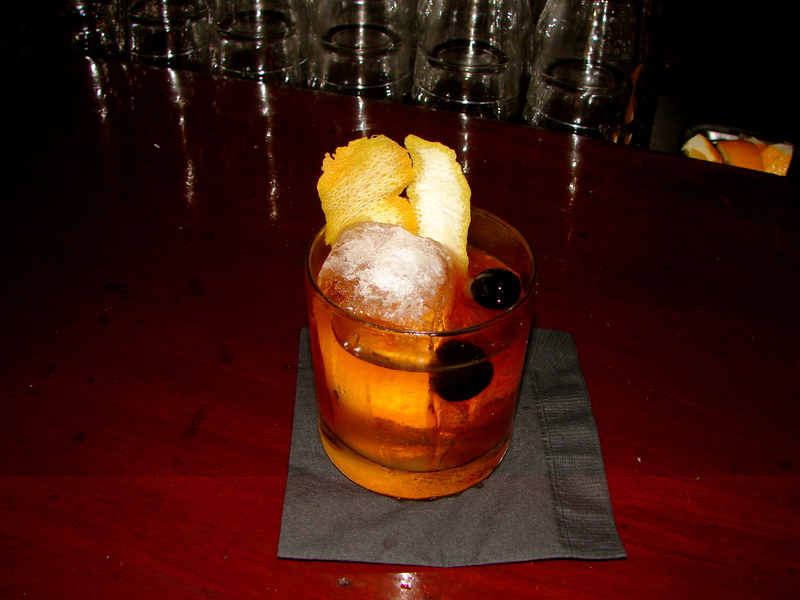 The drink is garnished with Orange Peels and a couple of Luxardo Cherries. A Luxardo Cherry is a dark, gourmet Maraschino Cherry (a very, very tasty touch that actually adds flavor to the cocktail). Dan ordered a Pastrami Dip with Spicy Garlic Fries while I, in order to decide who has the best Beef French Dip of the two L.A. “Originals”, ordered the same sandwich I ordered at Philippe’s. I had a side order of the Regular French Fries. 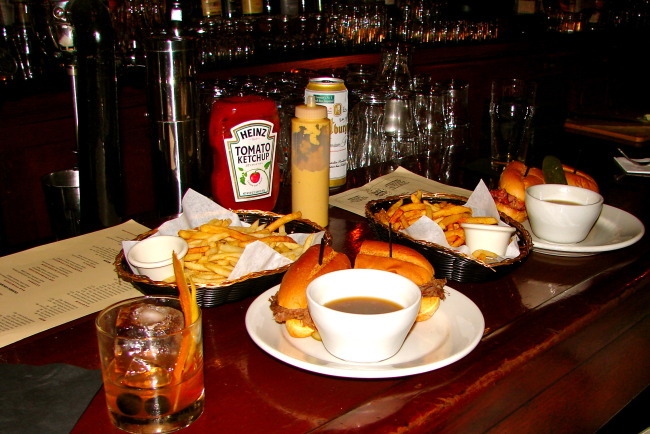 Unlike Philippe’s, you are given the Au Jus on the side and can make your dip as soggy (or not) as you would like. And now here are my results of Phillipe’s vs. Cole’s. Let me preface this by saying that it is difficult to compare the two places because they are very different types of restaurants. Best Beef French Dipped Sandwich: I like the softer, pre-dipped roll (no, my gums are fine) of the French Dip at Philippe’s, but if you like a harder roll, then Cole’s might be your choice. Philippe’s French Dip is also about a buck cheaper than Cole’s. (Edge to Philippe’s). Ambiance: Both are so varied in style, it is impossible to give the nod to either. In my opinion, Philippe’s is a great spot to meet for lunch. It’s a fun place to grab your French Dip after waiting in one of the usually long lines, eat at a communal table and go back to work. It’s not really a place I have ever lingered, but is an historic landmark for a good reason and must be experienced. Check out Cole’s unique table tops. They were made from the varnished doors of retired Red Cars of the Pacific Electric Railway. 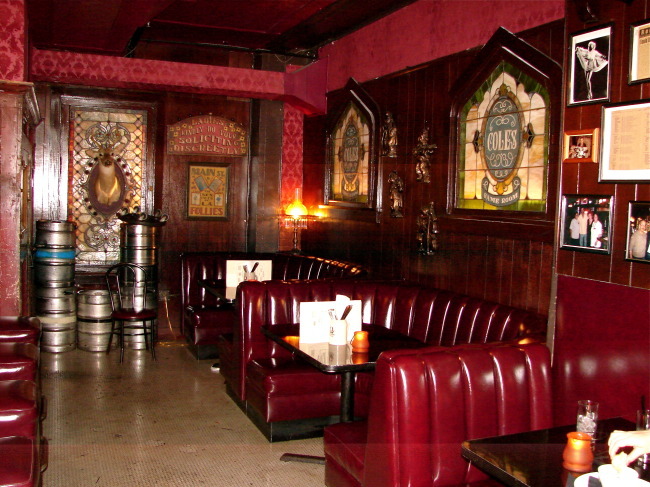 The tables were removed as part of the renovation and were reportedly relocated to the developer’s nearby corporate headquarters above another Los Angeles restaurant landmark, Clifton’s Cafeteria. Sides and Drinks: Philippe’s has good desserts, but I have never been enthralled with its sides including potato or macaroni salad, and you’d have to kill me to eat Coleslaw or a Pickled Egg. Cole’s offers French Fries (Philippe’s does not), and both the Regular and Spicy Garlic Fries were terrific. Decision: A Draw! Yes, I know, a wimpy decision, but one you should make yourself. In my opinion, you cannot go wrong at either of these historic downtown institutions.